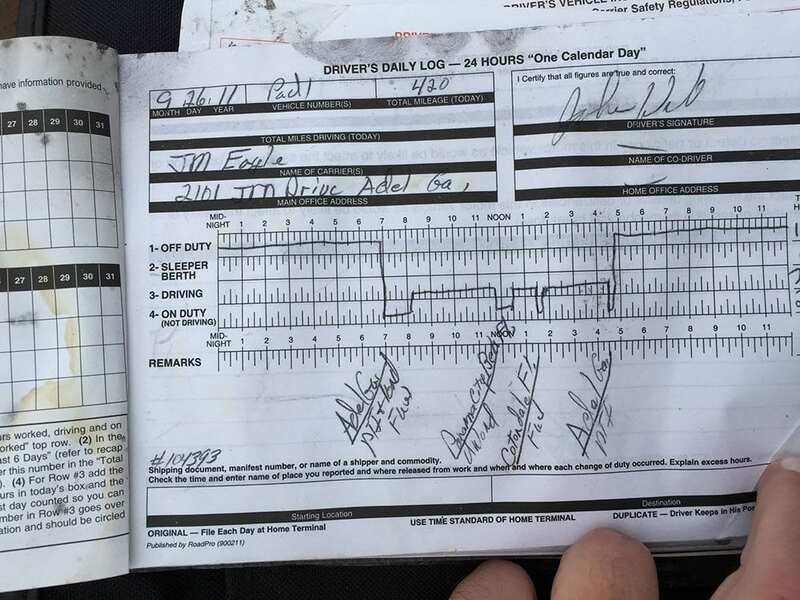 This is an Hours of Service log required by the Motor Carrier Safety Act to be maintained by all interstate trucking companies in the USA. When you’re trying to sue a trucking company, you need a lawyer who investigates before discussing a settlement. I found these logs under the seat of a truck that seriously injured our client when it pulled in front of him (a father of four children). I met with the insurance lawyer and his “expert” to inspect the truck about 50 miles from Albany, Ga. Simply, I was being told that I would not be able to determine if the driver was fatigued or cheating. Well, the insurance company lawyer was embarrassed, to say the least, when I pulled a book of logs out from under the seat of the cab showing that this truck had been traveling the highways and byways of this country. More importantly, a young, inexperienced lawyer might have believed the insurance company lawyer. An inexperienced, or uninvolved lawyer, might have never seen the vehicle – or looked under the seat. A lawyer who says he’ll settle your case quickly, probably goes for the quick settlement and may not do this type of investigation. That inexperienced lawyer may have never looked at the crucial issues of negligent hiring, supervision and retention. Be aware, pursuant to federal law, companies can discard or destroy crucial evidence per the MCSA six months after a crash. Six months later, the victim is left without representation and the shredder is going into overdrive. The lesson to be learned is to NEVER, EVER go it alone after a trucking crash or with a lawyer who doesn’t have trial experience against trucking companies and their insurers. You wouldn’t do your own appendectomy, would you?